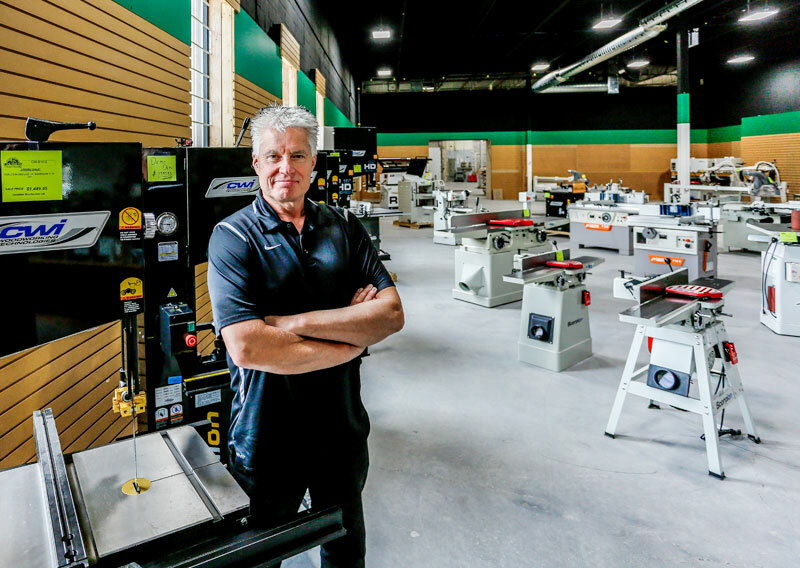 With showrooms in B.C., Alberta, and Manitoba, Cole Moore, president of Canadian Woodworker Ltd, is pleased to announce the opening of the first showroom and warehouse in the Greater Toronto Area. The new 10,830 sq. ft. store is located at 121 Hanlan Rd. in Vaughan Ontario, near the corner of Steeles Ave and Pine Valley Drive. Canadian Woodworker Ltd. specializes in the sale of quality woodworking machinery, hand tools and supplies and serves the retail, industrial and educational sectors. The retail side of the business specializes in high quality hand tools, power tools, and machinery for the novice as well as experienced hobbyist. The history of Canadian Woodworker goes back to 1967 when Mel Moore purchased a saw sharpening service called Borton’s Saw Shop. Prior to purchasing the business Moore had worked for both the T.S. Taylor Machinery Company selling woodworking machinery and then Norton Abrasives for almost 20 years. When an opportunity to own his own business presented itself, Moore borrowed $5000 each from his wife and best friend, and along with assistance from the original owner Fred Borton, the new Borton’s Sales and Saw Service 1967 Ltd. was born. Moore operated the business for the next 31 years, eventually selling off the sharpening division and expanding his sales of industrial tools and machinery. In 1988, Moore decided to purchase a competitor in Winnipeg called ‘Canadian Woodworker.’ The company specialized in hobby woodworking machinery, which Moore thought would fit well with his industrial based sales business. Moore retired in 1998 and sold both businesses to his children, Cole Moore and Erin Thompson, who then amalgamated both companies to operate under the Canadian Woodworker Ltd banner. Cole and Erin have both spent their entire careers working for the family business although both had other plans initially. It’s has always been a family business and when my father was setting it up, I was helping him out,” says Cole Moore. “Once I turned 15, I started to work at the sharpening shop and when I got my drivers licence I started doing deliveries. Moore said he was going to be a welder, but while he was looking for a job, he was working for the family business again, this time in ordering. “It’s funny, that really wasn’t the plan, I wasn’t planning for it to work out this way, I kind of fell into business, but now I’m very happy about it. And it’s a similar story for his sister (Erin). She also had other plans, but since 1980 she too is firmly entrenched in the family company. “So now we do it together,” Moore says. “I deal with the running of the stores and purchasing and my sister looks after inventory control, payables and receivables and computers.” Under their direction Canadian Woodworker has continued to expand, opening stores in Calgary (2005), Edmonton (2009), Saskatoon (2009) and Surry (2010). In 2016 the Surrey store relocated to Coquitlam and is now their largest showroom and warehouse at 12,400 sq. ft. The store is run by Cole’s son Remi – the third generation of Moores in the business. The Saskatoon store has since been closed and moved to the much larger location in Vaughan. On a business trip in 2013 Moore met a manufacturer who built high quality dust collection equipment who were willing to build custom machinery to Moore’s specifications. At the time Moore’s company had a large and loyal customer base enabling him to justify purchasing container loads of machinery to service their customers. The following year, Cole and Erin established CWI Woodworking Technologies and placed their first order for a container of DustFX dust collection equipment. Since then the company has developed a number of new brands of specifically built machinery under the CWI banner from factories in Italy, Taiwan, the Czech Republic, China, Latvia, Viet Nam, Spain and more. One of the biggest reasons for expanding into the Ontario market has been the steadily increasing demand for CWI machinery across Canada says Moore. With the establishment of the new store in the Toronto area, customers throughout Eastern Canada will have access to a central dealer for personalized service, quicker delivery, and on-time service and repair. Canadian Woodworker offers a large and unique selection of tools and machinery and Moore hopes woodworkers in Ontario will see the value of their expertise in a very competitive market. Moore says the business has changed dramatically during his lifetime. It seems that in 2008 everybody bought a computer and went online. As a result, the mail order part of the business has grown by leaps and bounds, but the stores are still essential to supplement that business. That’s another reason for opening the Toronto store, Moore says. Customers make purchases online all the time, but for larger items and especially for the service aspect for some of their larger machines, Moore says it is crucial to have a physical presence as well. After 40 years of working in the woodworking supply sector, Moore knows that quality and value are the most important consideration for woodworkers and their choice of tools. It is this experience which dictates the choice of manufacturers and the features and performance put into each machine of the CWI line-up. Moore believes this basic concept will bring continued success in making the company very attractive to woodworkers in Canada. Recognizing that the needs of woodworkers will vary depending on the type of work they do or the industry they are in is extremely important to Canadian Woodworker and CWI. This is why customers can find such a large selection of equipment specifically designed to meet the needs of cabinet and millwork shops as well as educational institutions and hobby machinery users. Moore says that their strongest segments for industrial machinery are nested base CNC equipment, high performance demanders, sanding equipment, and dust collection. In addition to the CWI line-up of machinery Canadian Woodworker is also the exclusive distributor in Canada for Italian made Casadei-Busellato machinery. Canadian Woodworker is committed to the future of woodworking in Canada and looking forward to entering the woodworking industries of Ontario. The company’s new store is open now and a special grand opening and open house event is being planned for October.